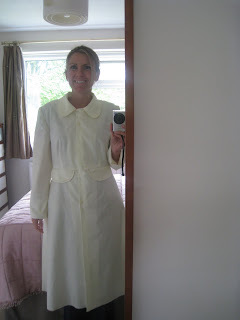 I am not doing any more to this at the moment, I am going on another sewing day in a couple of weeks so I am going to make it then. 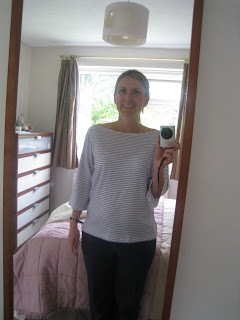 I have also made a muslin of the boat neck t-shirt from the Sew U book. It is too big for me as I made the medium because lots of reviews said how small the patterns are in this book, however I think a small will fit better. The neck opening is also too large so I will adjust that. This is going to be part of my casual mini-collection for the WIAW (wardrobe in a week) on Artisan Square. I haven't chosen everything yet but I have some striped jersey for this top and purple cord and grey flannel for two A line skirts from the Sew U book. I hope to make a checked shirt for my second top but I haven't found the right fabric yet. Preparation starts on Friday and sewing is the following week.